Team: H. Duys, D. Ellinwood, K. Gebbia, D. Gill – Captain, A. Griswold, B. Handal, T. Howe, S. Kulla, P. Maki, B. Martin, J. McKail, D. Millman, Bob Mitchell, J. Morgan, R. Rossi, S. Schraff, D. Skelly, C. Wilson. 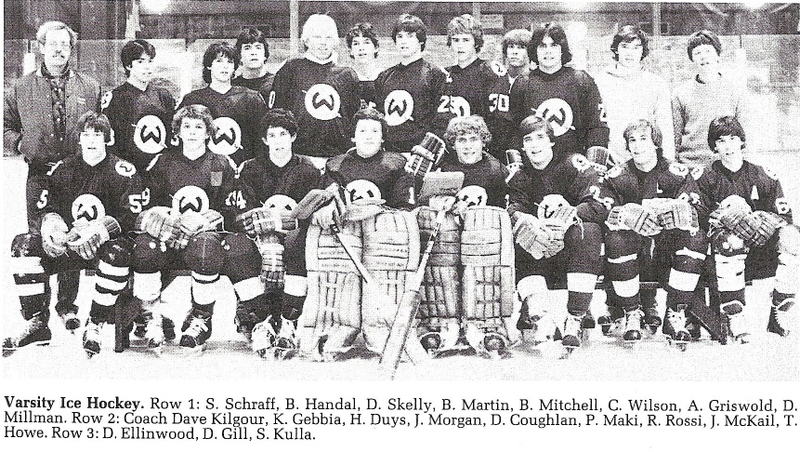 The 1982-83 season for the Wilton Varsity Hockey team was not a typical one by any means. 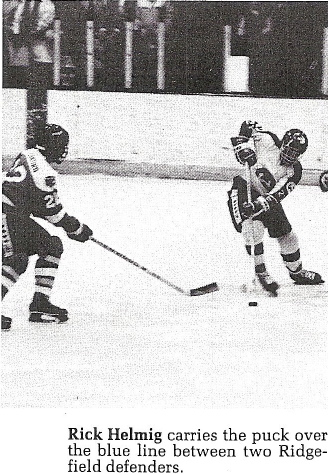 Though the Warriors established the worst record in school history (4-15) and failed to make the state play-offs for the first time in 11 years, they did pull off one of the biggest victories in Wilton Hockey history – They beat New Canaan for the first time in twelve years. Hit hard by graduation in the past year, the team was a young and inexperienced one going into the season. The Warriors began the season playing several rivals in close games. 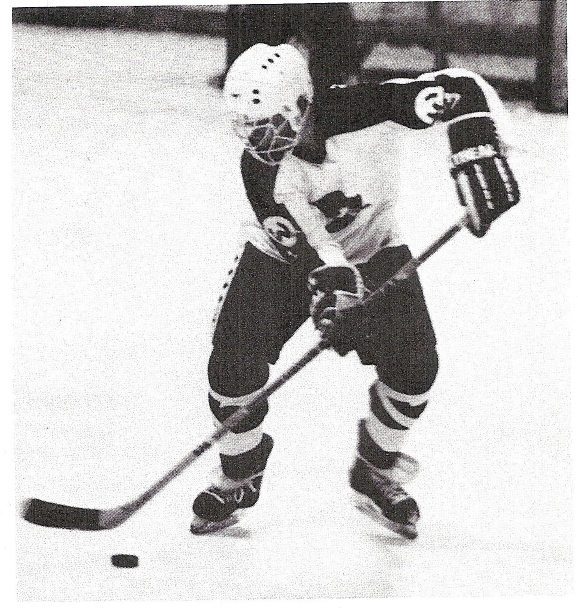 They were bolstered by the brilliant play of First Team goalie Bob Mitchell. Then came a ten game losing streak, which was very painful and frustrating for the players. But they refused to quit. Instead, the team pulled together and worked even harder. They were determined to make something of the season. 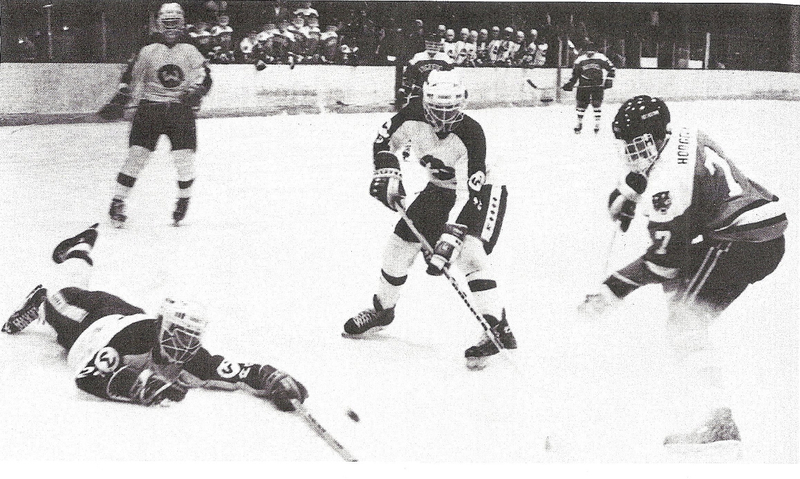 Their chance came on February 5th against mighty New Canaan. The Warriors played their hearts out for three periods in a team effort and beat “that town” for the first time ever. Though the season was a frustrating one in many respects, that big victory over New Canaan at the end of the season may have been the catalyst to set Wilton Hockey back on its feet for next year.